We have focused on making time-entry in TimeControl quick, easy and convenient because the truth is that team members just want to get their timesheet done – usually in a hurry on Friday afternoon. The fact that TimeControl is web-based means that employees can enter their timesheet from almost anywhere, as long as they have access to the internet. 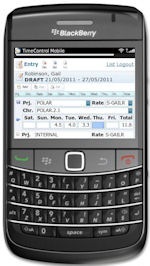 With TimeControl Mobile, users can even enter time from their smartphone mobile device. The TimeControl timesheet can be pre-populated with scheduled tasks imported from a project management system. The timesheet can also be pre-populated with tasks that the employee usually performs, we call this a personal pre-load. Having the tasks already in the timesheet means the team member simply needs to assign hours to the tasks that are already loaded. Another form of timesheet pre-load involves the use of the TimeRequest module. Employees request time-off or other special time through TimeRequest by filling out the date and description of the time (vacation time, personal day, banked time, etc …). When this time request is accepted, the time is automatically populated in the future timesheet. From the MyTimeControl homepage dashboard, employees can quickly see how much sick time, personal time and vacation time they have taken and is available. Training hours, banked time and more can also be seen if the company opts to track this type of time. This knowledge empowers employees to better manage their time and eliminates the need to be constantly be calling HR to ask for this information. This post has been a continuation of the TimeControl value propositions started last week. Over the coming weeks I will continue on this series outlining the key benefits of using TimeControl by company role. Last week we covered Executives and in the posts to come we will continue with CIO’s, Project Managers, CFO’s, Resource Managers, HR managers and Payroll managers. For more information on the benefits of TimeControl by role, please check out the TimeControl Value Propositions factsheet located on the www.timecontrol.com site.